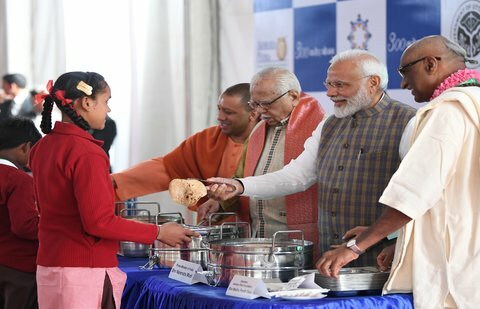 Prime Minister Narendra Modi serves third billion-th meal during Akshaya Patra Mid-day Meal Programme in Vrindavan in Uttar Pradesh; Says, programmes like 'Mishan Indradhanush' are gaining global recognition; Says, government making all efforts to provide triple safeguard to children in form of meal, vaccination and cleanliness. PM Narendra Modi today visited Vrindavan where he unveiled a ceremonial plaque at the event to mark the serving of "3rd billionth meal" by Akshaya Patra Foundation at Vrindavan Chandrodaya Mandir campus in this holy city. Akshaya Patra is a not-for-profit organisation that works with the government on mid-day meal schemes. PM also distributed Akshaya Patra to some of the children. The foundation has a state-of-the-art kitchen in Vrindavan. PM Modi served lunch to 20 children on the occasion. While addressing the gathering, Prime Minister Modi expressed happiness that the Akshaya Patra started during the Atal ji regime and now he got the opportunity to serve the "3rd billionth meal". He said, Government has given special focus on nutrition, vaccination and sanitation for children with schemes like National Nutrition Mission, Mission Indradhanush and Swacch Bharat Mission.